Today’s review is the second in a series for the 30th anniversary of Terry Pratchett’s Discworld. Coming after last week’s The Colour of Magic in the order of the books, Wyrd Sisters was actually the sixth Discworld novel, but the first one to be filmed for television in 1997 by Cosgrove Hall as an animated series in close cooperation with the Author. This was not simple children’s entertainment, but a surprisingly well done adaptation of the novel, overcoming its few limitations with great voice acting and stunning sceneries, bringing the Discworld successfully to life for the first time. Unfortunately all available DVDs have a disappointing image quality and the British release reviewed in this article is even out of print, but there is still a German release with English Soundtrack available. 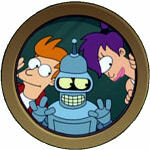 TV-News: Futurama cancelled – again! About four years ago, I was really happy that Matt Groening’s other animated series Futurama had been renewed by Comedy Central after they had produced four direct-to-dvd movies. Now, after four half-seasons with together 52 episodes, Comedy Central has decided not to order any more, effectively cancelling the series again. Once again, I read this first on Phil Plait’s Bad Astronomy Blog – and I can only agree with what he wrote – Futurama is not only a simple animated series, but amazing science-fiction storytelling that is completely unique in television history. This untimely cancelling is especially sad because the new episodes had become better and better and even reached the brilliant heights of the early seasons. The remaining 13 episodes, which are already produced, will air in the USA this summer with the DVD and Blu-Ray releases following shortly before Christmas. The final episode has already been conceived as a possible ending of the series, so there will be at least some closure. Maybe Futurama will just take a break for a few years and come back on a different channel… the producers certainly haven’t given up hope and are already talking about looking for an alternative home for Futurama! After an unscheduled, but much needed post-easter-break DVDLog is back this week – not with the latest and newest, but a translation of an article I had already posted last autumn in German: Roman Polanski’s The Fearless Vampire Killers alias Dance of the Vampires is a perfect companion for Tim Burton’s Dark Shadows and even one of its inspirations. Famously cut to pieces on its American release and only shown much later in its original version in the USA, Polanski’s little masterpiece has always been very popular in Europe and is still a great classic which delightfully refuses to be a typical vampire or horror movie. Warner’s DVD release from 2004 was unfortunately a disappointment, but even today it is the best version available and technically at least acceptable. This article, a slightly improved and expanded translation of the German version is more about the movie itself than a technical review of the DVD.